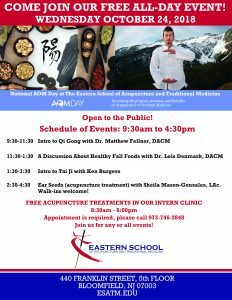 The Eastern School of Acupuncture and Traditional Medicine participates annually on AOM Day by offering free events and acupuncture to the community. The mission of ESATM is to offer professional training, education in acupuncture, Oriental Medicine, and traditional healing modalities that enhance the health and well being of the greater community. In support of this mission, the events at AOM day are for the general public in addition to the ESATM community, and will cover some of the acupuncture and oriental medical modalities as well as provide a fun and educational health-related day! The events run from 9:30-4:30 and include, Qi Gong, Tai Ji and a discussion about healthy fall foods. Free acupuncture treatments including ear seeds 2:30-4:30 (walk-ins welcome) and intern clinic treatments 8:30-8:00 (call for an appointment 973-746-2848) are also available. We at ESATM are looking forward to spending AOM Day with you!